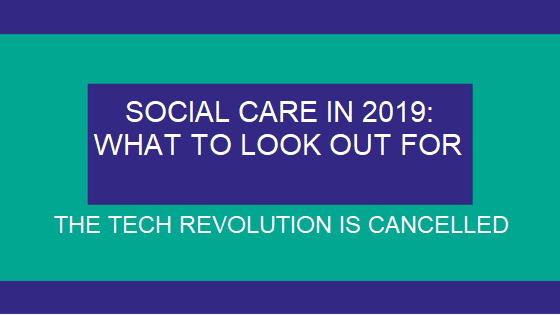 In our Future of Care Report, we forecast that eventually automation, AI and robotics would help change social care for the better, reducing costs and raising outcomes. Of course, this a long-term trend which is likely to take years. Health and social care, in particular the NHS, is oddly conservative when it comes to embracing change. In 2018, it transpired that 9 out of 10 hospitals were still reliant on fax machines, a technology most businesses – peculiarly, apart from football clubs – regarded as redundant many years ago. No wonder the government felt obliged to insert into the Care Act 2014 a requirement for health and social care to embrace digital technology. Anyone who therefore predicts an artificial intelligence or internet-of-things revolution in health and social care in 2019 is therefore not familiar with that fact, nor with the spending pressures within much of the sector. A number of reports have been circulating recently advocated dramatic technological change in the sector. Although these changes reduce costs and improve outcomes in the long-run, they require an initial capital outlay – whether funded from cash, borrowed funds or leased – that all but the biggest providers are simply not capable. Similarly, the introduction of voice recognition and smart home software into older people’s homes may have a very positive impact on their lives, but someone has to pay for it and show them how to use it. This was, essentially, the conclusion of a 2016 report on IT in the social care sector compiled by the Local Government Association. In it, they made a range of suggestions and recommendations for introducing more technology into the sector to improve financial and care outcomes: remote working for carers, strategic data analysis, greater use of assistive technology, and online portals. The report also highlights some noteworthy examples from councils and other organisations across the country, but some are quite obviously stretching the point. Note, for instance, Rotherham Metropolitan Borough Council’s “holistic” digital strategy, that in reality appears to have little impact on social care. The report’s own conclusion states that “financial challenges experienced by the sector have been significant, with often limited resources available locally to implement many of the solutions highlighted within this paper”. It then quotes the statistic that only “32 per cent of councils strongly agreed that there were adequate resources for technology implementation and change management”. Digital technology has the potential to have a huge impact on the social care sector, but for now, that impact will be limited to a handful of larger providers. The rest will have to settle for incremental change or their traditional methods. Click here to read the first installment on our series on funding and the government’s green paper.